Slotsvandmøllen was first mentioned in 1436. The oldest mill buildings belonged to the castle and later the renaissance castle in Tønder. The present building, inscribed with the date 1598, is the oldest industrial building in the town. Granite boulders from the Greyfriars' abbey, which burned down, were used for its base. The mill was listed as early as 1921. It was originally a grain mill and besides milling, grain was traded there, followed by animal feed and fertilizer. After the business closed, Tønder Municipality took over the mill in the 1970s. From 1799 until the 1970s, the mill belonged to the Bachmann family, which is why it is also called Bachmann's Watermill. In the 1930s, the mill supplied electricity with the help of a turbine system. Electricity production continued until 1976, when the mill buildings were pulled down – all but the listed watermill. 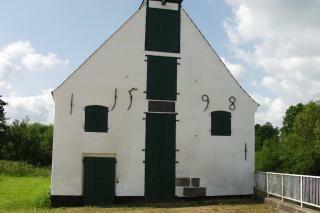 In June 1974, Tønder Viseklub held a musical gathering at the mill, which was known ever after as Visemøllen (the ballad mill). This event blossomed into Tønder Festival, which is held every August. Bachmann's Watermill is currently at the heart of a nature restoration project. The dam at the mill has previously prevented the houting, a salmonoid, from swimming upstream in Vidåen. That has now been remedied, as a new fauna passage has been constructed beside the millpond. Lydum Mill Power to the watermill!